Melanie was built in 1919 by the German shipyard Abeking & Rasmussen, and previously bore the names WOLF and SANPAN. 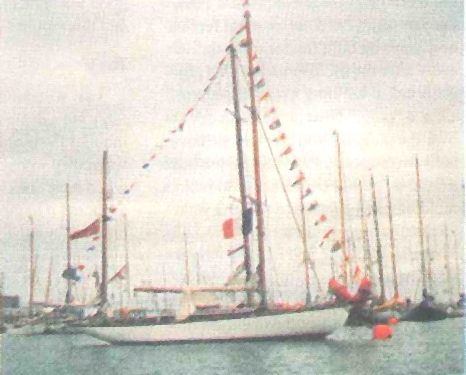 The 42’ sailboat was purchased in 1956 by Sir Eric Seal, Winston Churchill’s former secretary. 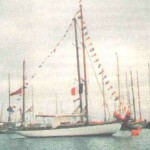 After Seal and a group of civil servants restored her, MELANIE became the first yacht of the Civil Service Sailing Association. 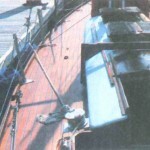 After a dismasting in 1960, MELANIE’s original gaff rig was replaced with a Bermudan rig for easier handling. When Seal died, he left his share in the boat to Peter Townrow with the express wish that he keep the boat in good repair and continue using it to take underprivileged young people sailing. Townrow, a retired Seaman/Gunner with the Royal Navy, skippers MELANIE in training Sea Cadets and other youngsters to sail. To restore MELANIE’s deck, owner Peter Townrow first ripped off the old deck, top planks and most of the crossbeams. 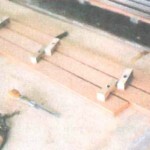 He then installed new pitch pine beams and laid ½“ plywood over these. He completed the job by laying new teak planking. During the restoration, Townrow used a hundred wood blocks with curves cut into them (like this one) to old the teak planks in place. 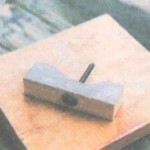 Steel coated dome-head screws drive trhough the curved locks and betwee the planks applied pressure to the planks without marring them. Townrow filled the deck seams with WEST SYSTEM 105/206 mixed with graphite powder. MELANIE at the Classic Boat Rally in Brest, France.